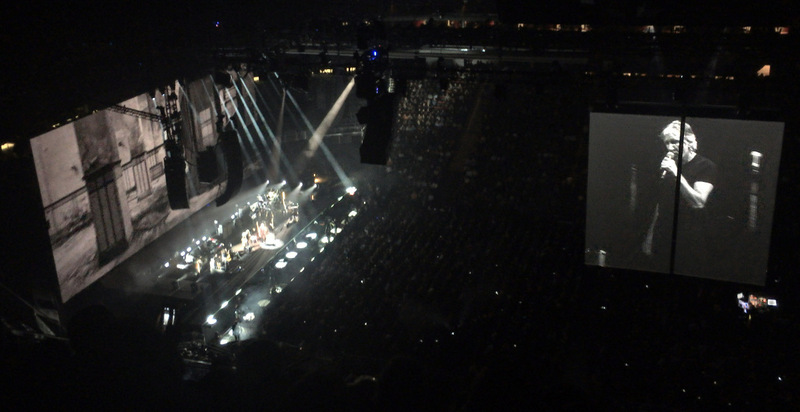 Last night, Thursday, September 7th, Roger Waters returned to New Jersey to perform at the Prudential Center in Newark: the band returns after a three-week break from the road and for the first time in the Garden State since holding its dress rehearsal for the tour in the Meadowlands arena, not far from the Prudential Center, last May. Last night's performance featured not only a re-energized and sharp-sounding band but also a focused one: the band stuck to its core performance set list, executing all tracks in fine form. When the tour played the last show on the first leg of this US tour, Waters had added the track Mother. The track did not resurface tonight, quite possibly to meet curfew requirements: last night's performance began later than usual due to traffic problems, according to Waters. The band's cohesiveness was surprisingly strong when they performed at the Meadowlands four months ago (considering it was a dress rehearsal) but last night’s performance demonstrates how strong the band's chemistry has become in the months they've been on the road. There is one personnel change though it seems to be temporary: keyboardist Bo Koster, of My Morning Jacket, has replaced Drew Erickson, apparently due to an injury afflicting Erickson. Waters has recently added dates in Australia and New Zealand: the window to see the tour in the US is closing. The Us + Them tour is an incredibly immersive experience and one worth taking in from more than one angle: fans on the floor, near the stage, will experience a very different performance than the one someone sitting in the highest parts of the stands will: both are mind-blowing… but for very different reasons. Roger Waters' Us + Them tour moves to Buffalo on September 9th and returns to New York City September 11th through the 16th.